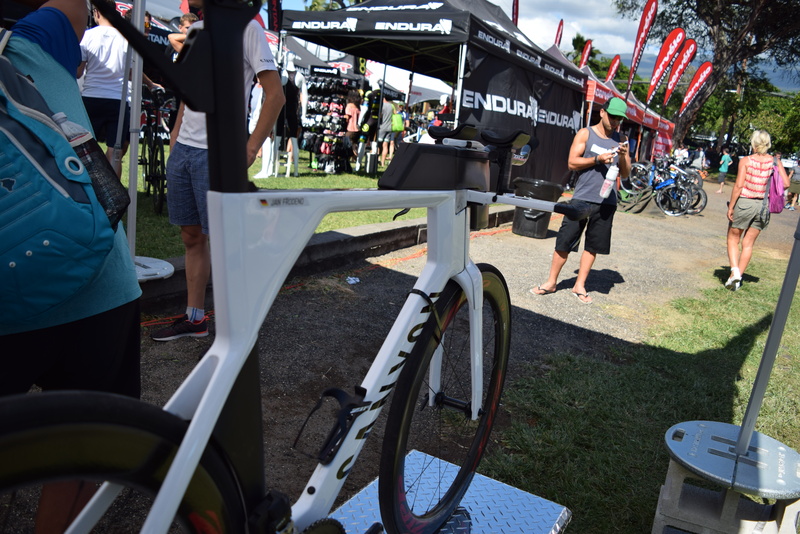 This is the first in a series of posts looking at some interesting features of the pros’ bikes at the Kona 2015 Ironman World Championships. I hope to point out some stuff you might not notice otherwise. Most shots are from bike check-in with some from the expo. The first two specimens just happen to belong to the first two finishers, Frodeno and Raelert. And coincidentally, both are made from pure 100% high-modulus unobtanium. At least if you live in the US that is. Canyon is not selling in the US market yet, as they have a direct to consumer model and rely on a central service facility in Germany to support European customers in lieu of a dealer network. They say they are working on bringing this to the US. We will see. Andreas’ Cube is a true cost-was-no-object one-off, but Cube claims they are using it as a development platform for future stock bikes. 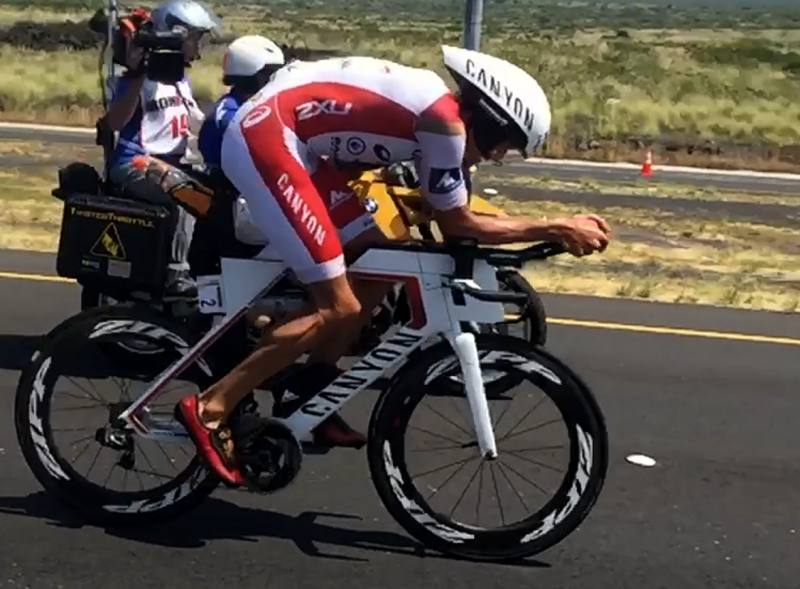 Although this is not the bike Jan raced on in Kona, the setup is mostly the same. 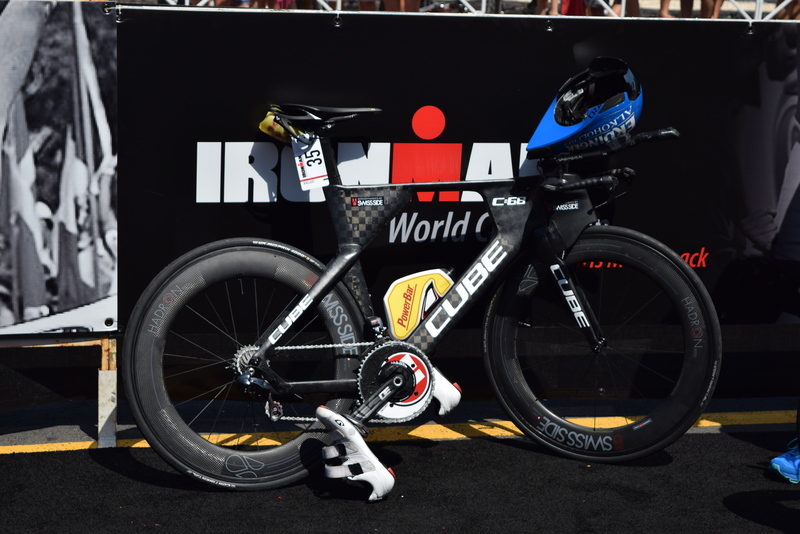 For the race, he switched to an Elite aero bottle on the down tube and ZIpp 808 wheels. Besides the overall angularity of Canyon’s latest superbike, the front end treatment is also striking. The hydration unit hangs in front of the head tube and sits on top of the stem. A trapezoidal bento box blends seamlessly with the back of the bottle. 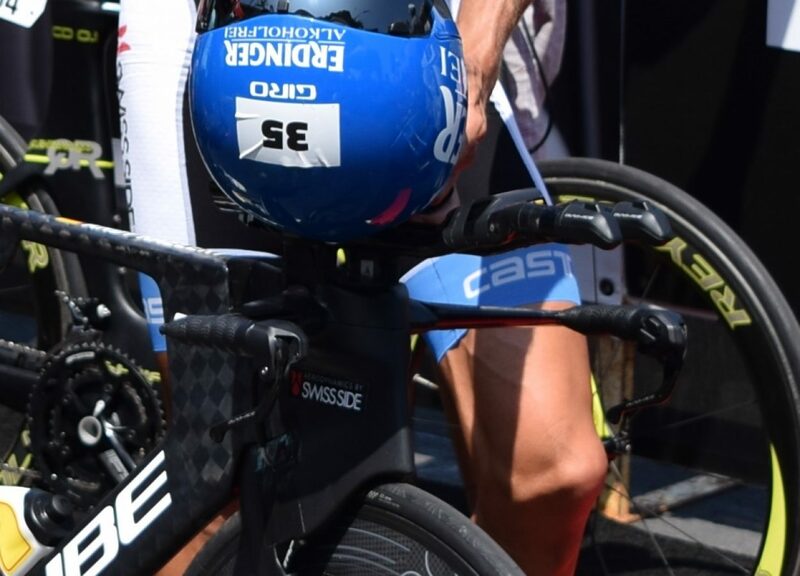 Jan uses a Sram Quarq power meter and a Fizik Tritone nose-less saddle. Jan rides with his elbows jammed together. This CAN certainly be more aero, it can also be quite uncomfortable for most folks. He also runs a relatively low hand position in a time where many are re-recognizing the potential aero benefits of higher hands. 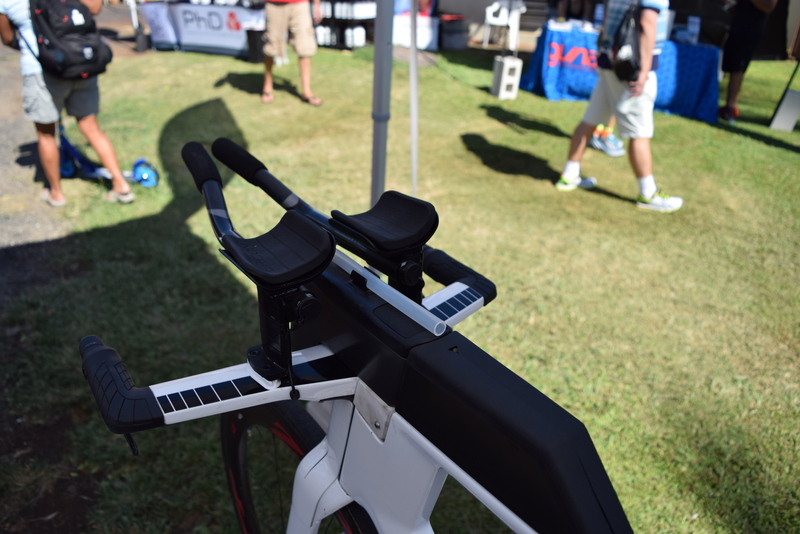 The base bar is quite square and has integrated rubber grips. It also sits very low due to the integrated stem design. Note the clean positioning of the drinking straw and the spacious bento. Is there a curve anywhere on this bike? Actually there is – the leading edge of the bottle is curved. Obviously Canyon makes generous use of Kamm-type truncated airfoils. But you have to wonder if all those square edges are as aero as they could be – like the trailing edge of the bento and the bottom of the hydration bottle, not to mention the very stubby square-section basebars. Looks like aesthetics came into play here, but in the end maybe it makes very little difference in performance. Frodo uses Sram Red E-tap “wireless” shifting. Note that there are still plenty of wires in the cockpit area connecting the shifter “blips” to the control box – they are just well hidden within Canyon’s spacious front end storage. 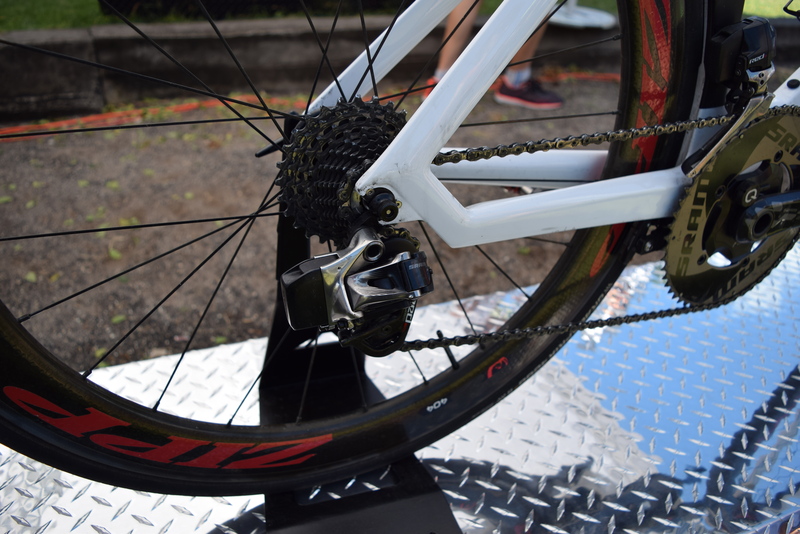 The small grey box attached to the derailleur is the removable battery – each derailleur has its own and they can be swapped between derailleurs as well. 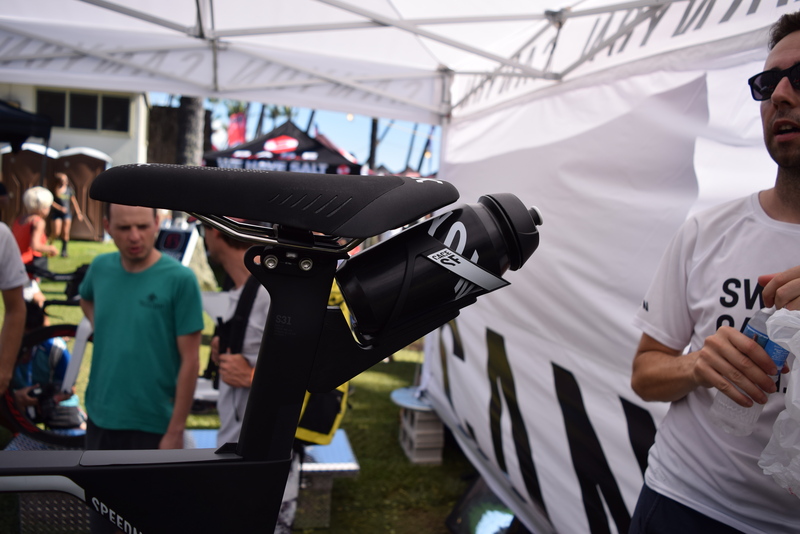 The rear hydration mount is integrated with the seat post. See that little fin in front of the seatpost on the top tube? That is a lid for yet another storage chamber within the triangular frame gusset. Frodo’s position looked great. Move along, nothing to complain about here. 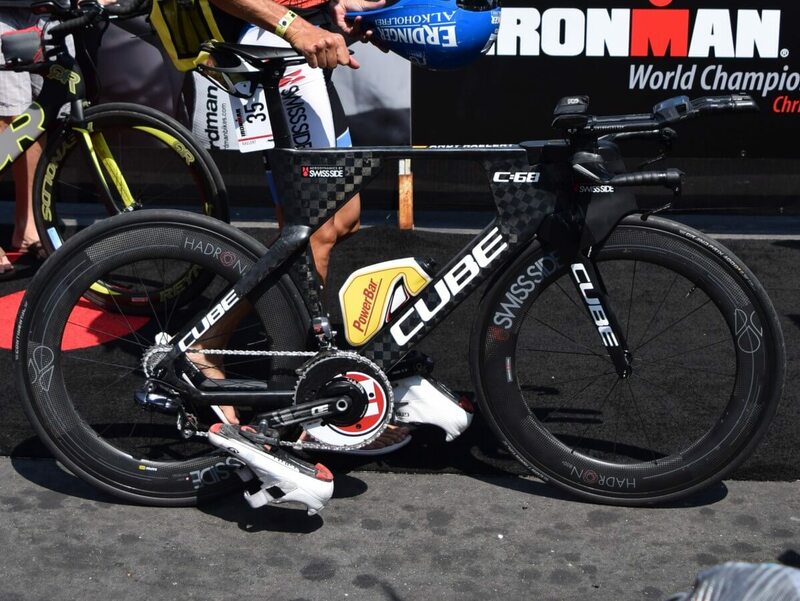 Andreas Raelert’s one-off Cube C:68 ranks as one of the most striking bikes in Kona this year. F1 engineers Swiss Side pulled out all the stops to make this bike as aero as possible. 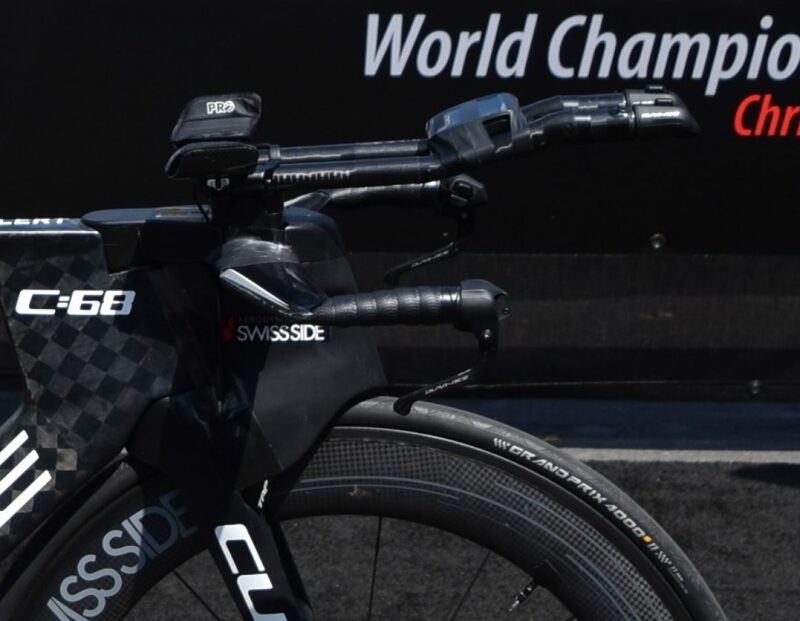 Yet, most of the aero features are similar to those found on other superbikes – the seat tube gusset (Canyon), the smoothly-integrated front end (Scott), the deep aspect-ratio head tube (Cervelo and Scott), the kinked chain stays (Blue), and the “big block” carbon (Felt). Unlike on Frodo’s Canyon, the front hydration unit is practically sealed to the front tire. Clearly Swiss Side’s aim here was to divert flow around the fork/wheel complex. Others have gone opposite way by widening the fork leaving large gaps between the front wheel so that air can presumably flow between the wheel and fork. This is a touchy area in the aero world – two objects with a gap between them can “act” like one big object to the air flow (bad). So maybe best to keep everything narrow and force the air around everything. The bars are modified Profile Aerias. Note that Andreas chose Shimano Pro elbow cups though. No BTA bottle here – instead we have a Garmin affixed with electrical tape. Aerobar shifters are the Dura-Ace 1-button type (they only operate the rear derailleur in one direction or the other). You get another good look here at the front hydration unit, with TRP brakes just barely peaking out. Tires? The ubiquitous Conti GP 4000 S2. He actually left it unaccompanied for a short while in the chute. Andreas was running Rotor 3D cranks, FSA aero rings, and a Power2Max power meter. Wheels are Swiss Side Hadrons. Presumably they are not intended to super-collide – just go fast. And yes, those are only (GASP) Ultegra 6870 Di2 derailleurs – probably cost him .001 watts versus Dura Ace. As noted before, Andreas did not run a BTA bottle, but chose a frame-mounted aero bottle and two cages fastened under the rear of the saddle. Gotta wonder if Swiss SIde approved of the frame bottle and lack of BTA, as both of these generally increase drag. Andreas’ fit was excellent on the Cube. Like with Frodo’s fit, it is hard to complain about anything here. Notice the Zipp rear wheel, courtesy of neutral support after a flat. 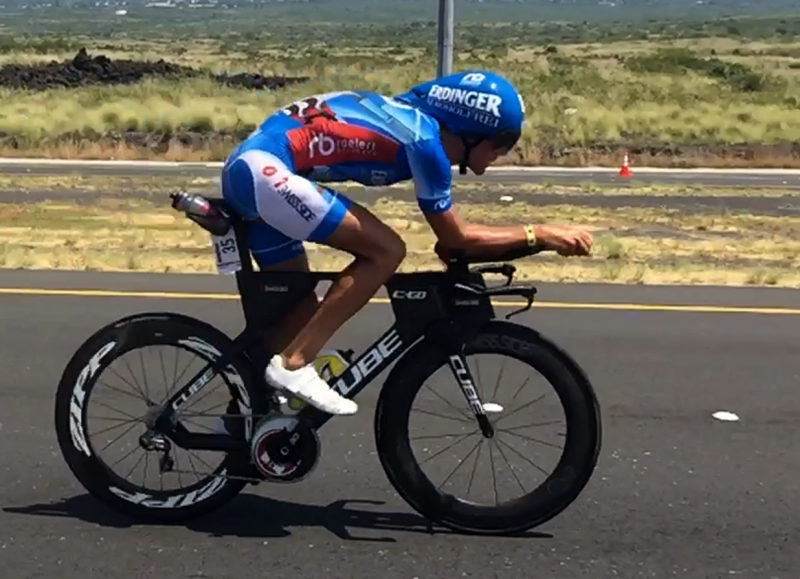 Even so, Raelert’s bike time was only minutes off the top split. 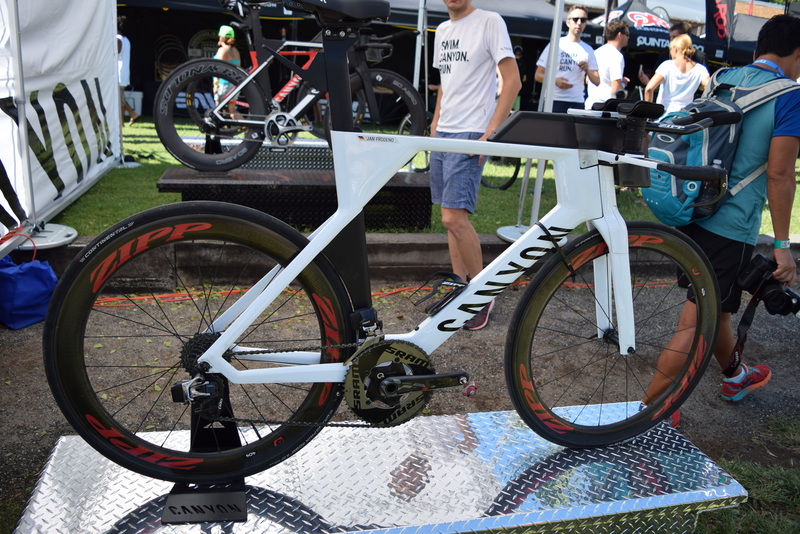 Ventum One: first looks, frame buildup, and early road test impressions	Kona AG Women Bike Split Analysis: How fast do you need to be, and how did Lis do in 2015?